What is is, but that doesn't mean it's what has to be. 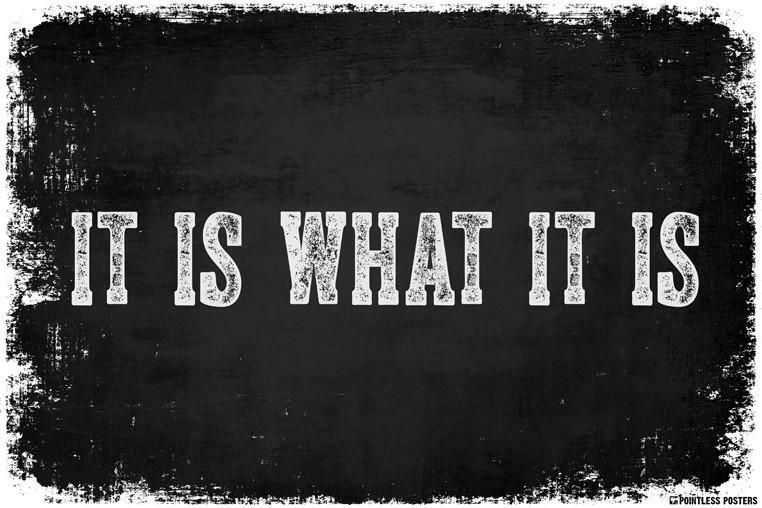 “It is what it is.” Has anyone else noticed the popularity of this phrase in recent years? Perhaps in this era of big fears we feel swept along by forces we cannot control. It’s become almost mantric for some people. On the surface, this statement seems to be highly pragmatic and even a little bit wise. But, I wonder. When you look deeper it’s an expression of resignation, surrender. Certainly there are things in life – despite our positive thoughts and motivated action – that we cannot change. I cannot make Monday Friday. I cannot be 10 years old again. However, we can’t allow the times, our circumstances, or other people to convince us that the realm of things over which we lack control is large. We are powerful beings with powerful minds and we can control far more of our individual and collective destiny than we’ve been taught.